Above/featured: Train service cancelled between Dresden Hbf and Frankfurt Airport, 22 Apr 2015. In Germany, I am neither first-time visitor nor a permanent resident. In this interesting middle-ground, having traveled in and around the country every year since 2001 means gaining knowledge and some handle of the language, whether it’s reading the signage or speaking to people to get some help. As of writing (20 May 2015), the GDL locomotive drivers’ union have struck for the 9th time in the last 11 months. The present strike does not yet have an announced stop date (which is new), but will likely match or exceed the recent 5-day stoppage in early May, which at that time was the longest in Deutsche Bahn’s 21 year history. A significant fraction of the full passenger- and freight-capacity has been affected. In the German capital city of Berlin, regional trains and S-Bahn trains are affected (reduced), whereas the city’s bus, tram, and U-Bahn networks remain in full operation. Live-Auskunft (“live information”) : a dynamic link providing an overview of trains traveling along your specified route; cancelled trains are not shown. Reiseauskunft (“trip information”) : a dynamic link providing a schedule of trains traveling along your specified route, which will show cancelled trains (red ‘x’) and possible alternatives. From a day-to-day standpoint, I have used both links to check what was and was not available for my desired route, providing valuable information for advance planning. During the 5-day long strike (5 to 10 May) and despite a significant fraction of train routes cancelled, I was fortunate I needed only to travel from Berlin to the cities of Bielefeld and Frankfurt am Main. The following graphic shows what routes remained in operation and to what frequencies (if any) these routes ran. Operating & affected long-distance trains: Deutsche Bahn drivers’ strike, Apr/May 2015. Click here for full PDF. Regular hourly trains (thickest solid colour line) ran between Berlin and Düsseldorf and between Berlin to Köln. Other trains ran every two hours (thin solid colour line), every four hours (long-dashed colour line), or only one train the entire day (dotted colour line). It meant for some “interesting” change-of-trains, service delays, and for others, a very long day on the train. During this last strike some minimum level service was maintained with a train “approximately” every two hours among the country’s five largest cities: Frankfurt, Köln, München, Hamburg, and Berlin. The graphic above shows the makeshift operating model over the last couple of strikes in late-April and early-May. There’s no guarantee these routes and services (or frequencies) will be maintained in the present strike, which means keeping abreast of service updates (re. Live-Auskunft, Reiseauskunft). • sense of adventure and a very good sense of humour. But these are characteristics we all think we should have and practice, OR? I had advantage of having a general familiarity with the country, and being able to read and speak some German. I took the strike in stride, and I didn’t panic into buying a ticket on a long-distance bus service, although for a few moments I admit sweating out a few of the details along the way. During the early-May strike, I traveled from Berlin to Bielefeld just fine, but Berlin to Frankfurt was a bit of an adventure on a fully packed train. 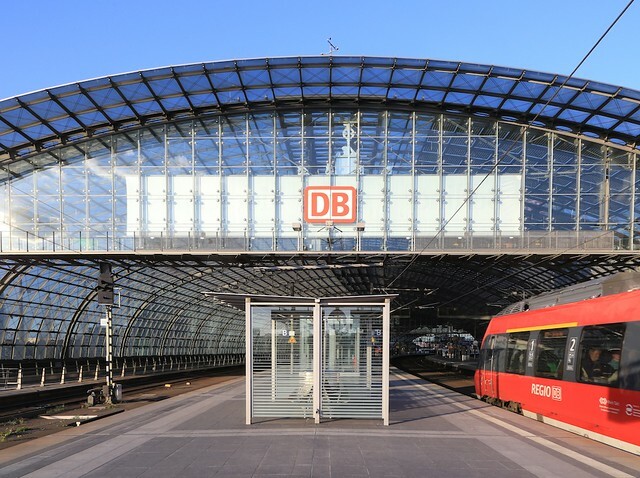 The rail strike ends 21 May with Deutsche Bahn and the GDL union going into arbitration and a period to continue mediated negotiations. Regional service should be back to nominal operation by 22 May, and long-distance service to nominal operation by this (Pentecost holiday) weekend 23/24 May. Full S-Bahn service in Berlin is scheduled for 22 May. …Ersatzfahrplan im Nahverkehr gilt noch heute. Ab morgen, 22. Mai verkehren Züge weitgehend regulär. Alle Kulanzregelungen gelten noch..
#Bahnstreik beendet. Ersatzfahrplan im Fernverkehr noch am 22. Mai. Rückkehr zum Normalfahrplan am Samstag. bahn.de/liveauskunft ..
Bis zum 17.Juni wird es keine weiteren #Bahnstreiks geben. So lange wollen Bahn und GDL versuchen, sich im Tarifkonflikt zu einigen. Disclosure: No Connection, Unpaid, My Own Opinions. I am not affiliated with and have no material connections with Deutsche Bahn. This post appears on Fotoeins Fotopress at fotoeins.com as http://wp.me/p1BIdT-6Mn.